The Trimmer Shampoo Unit, on the left, includes a behind-the-bowl laminated bottle well, and a soiled-towel grommet w/ access door on right. It measures 25"W x 21 3/4"D x 36"H. Includes 8300-570 shampoo bowl. 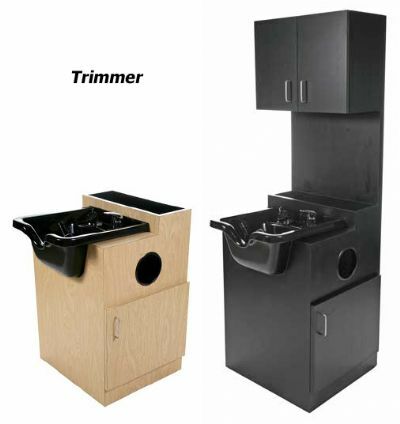 The Tall Trimmer, on the right, adds a backsplash & upper clean-towel storage cabinet w/ two hinged doors. Tall unit is 25"W x 21 3/4"D x 73"H. Includes 8300-570 shampoo bowl.